Unlike, most teen-agers and many adults who go all weak on their knees reading love cards and love letters, girls giggling and gushing over the gifts, a coffee date or even a rose from their supposed secret crush; I had no such experience, first, I went to an all girl’s school ( a Birla school followed by a convent) so the question of boys was never really there and second, I grew up convinced that Valentine’s day was meant for girls who never took life seriously, for them it was all about Yash Chopra love stories and their idea of an ideal man was largely grounded on tall, dark hand-somes of mills and boons. Having said that, I do like to watch love stories, and I confess I enjoy them immensely, but for me they end with the end credits, I never did as a teen ager nor do I still visualise my life like thos, on screen. Moreover, a bong who grew up in Kolkata, our Valentine’s day or Bhalentine’s day ( as many bong’s would pronounce) are long gone or yet to come. You see Bengali Valentine’s day is celebrated on Saraswati Puja, when girls dressed in their fine sarees huddling in groups and giggling for no apparent reason and the local boys, trying every possible way within the restricted social norms to seek attention and possibly woo the girls. I am not an anti-valentiner, it is just that I feel you really do not need a special day to declare your love for someone. Thankfully, I have a husband who does not go over board with the whole romantic thing, he has his own subtle ways of showing affection and I like it that way. We did not do much, we settled for a home cooked lunch and then a quiet dinner at our local Chinese Bistro. The overt display of affection and love do not work for me and I do not do roses, nope I don’t like the flower, so cupcakes were some thing I wanted, and cupcakes are what I got. So I followed the recipe to the T, just to see if the taste works for me and remarkably the gravy in spite of whole to broken spices, tasted so smooth and I fell in love with the taste. 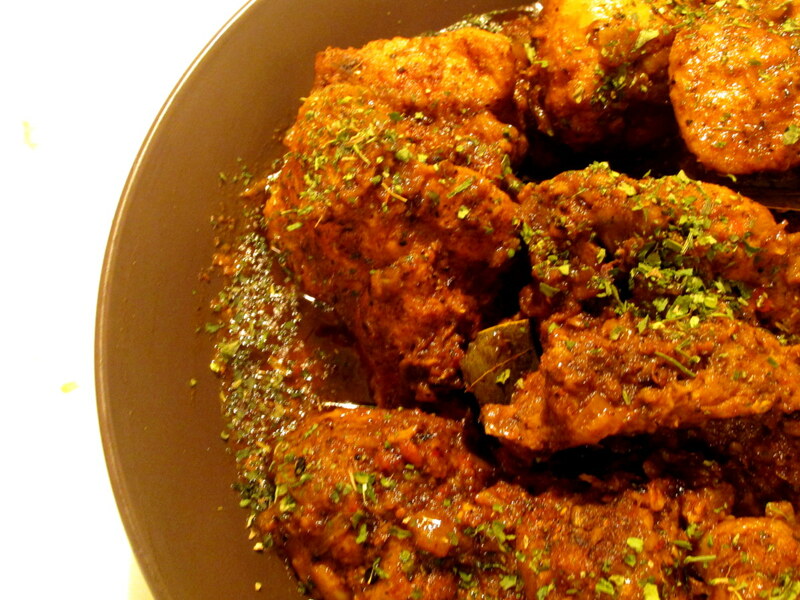 So here it is I am sharing her recipe; it is a must try for chicken lovers. The process is slightly long and may take a lot of patience, but trust me the effort and wait is worth it. I am going to write out the recipe in points to make it easy to follow. 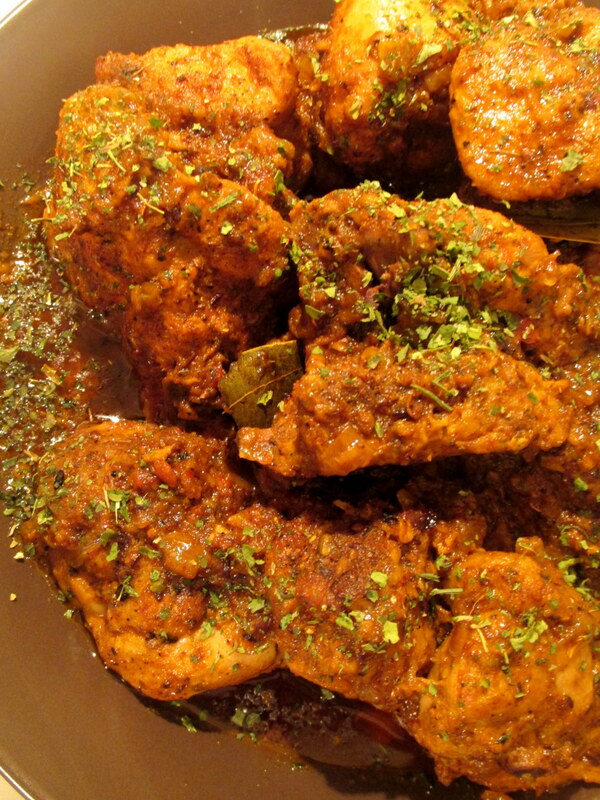 Clean the chicken and then marinade by rubbing 1 tsp oil & 1.5 tsp salt over the pieces.Set aside for 5 minutes. Then in a small sauce pan, on low heat,roast all the whole spices [except turmeric,nutmeg & salt] till you smell the aroma.This takes about 5 minutes. 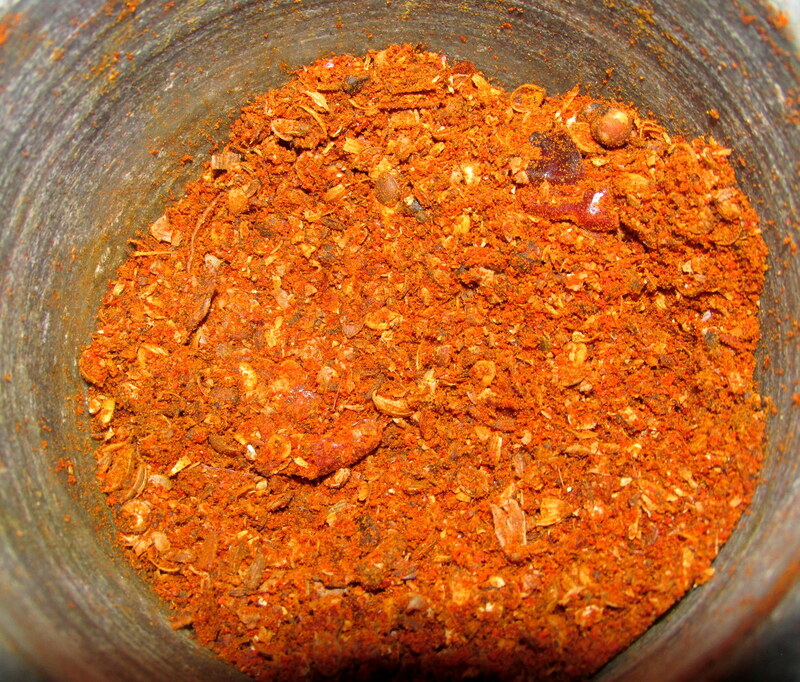 Once cooled, coarsely grind the spices and then add turmeric, ground nutmeg & salt to the ground spices to make a mix. Now rub half the amount of spice mix all over the chicken .Let sit for 10 mins or so. Mix the rest of the spice mix with beaten yogurt & set aside. Meanwhile, heat a grill pan [or a normal pan] to smoking hot.Once hot,brush some oil on the pan and layer the chicken pieces on the pan. Here, the idea is just to sear the flesh of the chicken [not cook it].You can even do it in the same pot in which you want to cook the sauce,I prefer a wide open pan for the sake of searing all piece in one go & easier flipping.Let sear for about 5 minutes on each side. Once seared, remove from heat.Reserve the drippings if any. Next, add the grated ginger & garlic to the pot along with bay leaves and cinnamon stick. Cook for 1 minute more.Let the heat be on low. Add the spice mixed yogurt to the pot next and combine well with onions.Cook for 2 minutes with constant stirring to avoid curdling of the yogurt.You will slowly see yogurt releasing water. Next add the seared chicken pieces to the pot next, pep up the heat to medium and cook the chicken pieces for 5 minutes.Check the salt now [ remember we rubbed chicken with salt earlier] and adjust if required. Also,add the drippings[ if any] from the grill pan to the pot. Again, reduce the heat to lowest possible on your stove, cover the pot and let the chicken cook to fully done.About-30 minutes. Do not add any water and let the meat cook in its own juice. 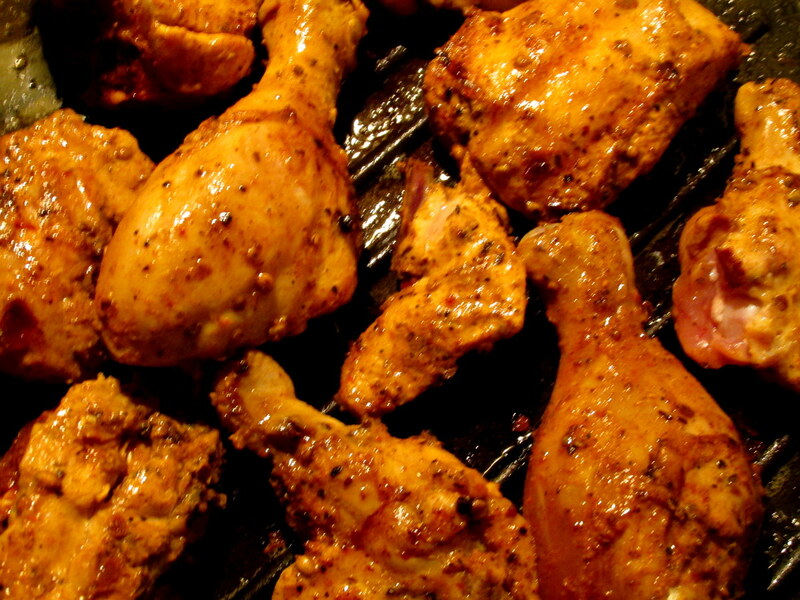 As the chicken cooks, it will release its own juices and it should be enough to cook it.Do stir in between. Garnish with cilantro & sliced chillies. Once the chicken is cooked, remove from heat and let sit covered for another 10 minutes. Serve it with Jeera Chawal, Matar Pulao, naan or rotis. Whenever adding yogurt to hot pot, ensure that the stove is on the lowest mark. Reduce the heat to minimum. P.S. I don’t want to sound all unromantic and to end valentine’s day on a sweet note I leave you with one of my favourites. really… 🙂 that is so funny.. Thanks for the shoutout. I m glad that you liked the recipe. One of our favorites!